Feeling lovesick searching for Valentine's Day gifts that endear, excite, and enrapture? At The Savory Pantry, we profess a passion for pleasing palates—especially that of your Valentine—with unique gourmet gifts and Valentine's Day gift baskets! Looking to elevate Cupid's perennial go-to? 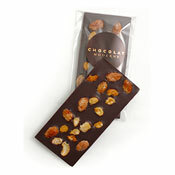 Captivate the chocoholic in your life with our Chocolate Valentine's Day gifts. 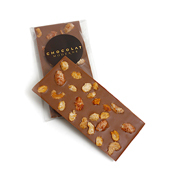 Give a little nibble such as our chocolate toffee almonds, drinking chocolate, or chocolate peppermint creams. Choose our Bite of Chocolate or Chocolate Decadence Gift Boxes, filled with bars and bags of chocolaty goodness in a richly bowed box. Or go all the way with The United States of Chocolate featuring nine indulgent artisanal coast-to-coast favorites. Make joyful your Juliet, va-va-voom your Venus, and declare desire for your doll with Valentine gifts for her. You'll make her feel like a queen with Prestat's Pink Marc de Champagne Chocolate Truffles, hit her sweet spot with Beekman 1802's Heirloom Dessert Cookbook, and keep her sipping with our Tea Lover's Tote. Romance your Romeo, heat up your heartthrob, and charm your Cassanova with Valentine gifts for him. 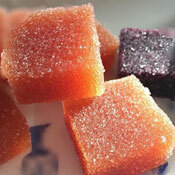 Wrap him up in Bushwick Kitchen's Bees Knees Spicy Honey, Savor's Moka Ginger Savory Shortbread with Smoked Back Pepper, or Woodford Reserve Bourbon Cherries. Ready to ignite a passion for Valentine's Day cocktails? Shake up your special someone with The Hudson Standar's Love Struck Bitters and Raspberry Verbena Shrub, or Liber & Co's Tropical Passion Fruit Syrup, and watch them swoon!